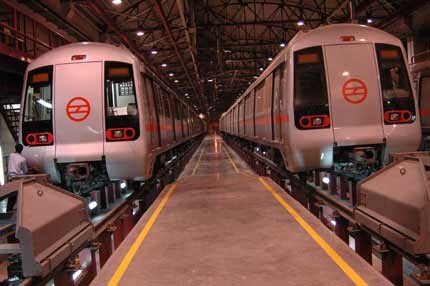 Delhi Metro Rail Corporation, accord high priority to Environment, Occupational Health and Safety (EHS) in maintenance of stations, structures and systems. To strive for continual improvement in our Environment, Health & Safety policies, processes and procedures. To comply with local and national Environment, Health & Safety Laws. To make all-out efforts to create Environment, Healthy & Safety awareness amongst our Employees, Metro users and Maintenance personnel. To maintain Assets so as to enhance their aesthetic appeal, optimize the use of energy, cause minimum negative impact to the environment and to ensure safety of the personnel. Adopt environment - friendly construction methods and practices so as to cause minimum inconvenience to the public and prevent ecological degradation. Create assets that are aesthetically appealing, optimize the use of energy and cause minimum impact on the environment. Conserve and enhance green cover through transplantation of trees and compensatory afforestation. Make all efforts to create environmental awareness among our employees, contractors and metro users. Strive for continual improvement in our environmental policies, processes and procedures. Comply with applicable local and national environmental legislation. The ticket, which could be a card or a token, is purchased from the Ticket Counter. The passenger then proceeds to one of several gates that separate the Paid Area from the Unpaid Area. Here, the passenger will hold the ticket close to the machine to the right of the gate. If valid, the gates will open automatically, and the passenger can pass to the Paid Area. If not valid, the message 'GO TO OFFICE' will be displayed on the machine, and the passenger will need to contact the Customer Service Staff. Most convenient for the frequent commuter. 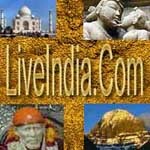 A stored value card, Travel Cards are available in the denominations of Rs. 100, 200 and 500. The Metro Trains run from 6:00 AM in the morning till about 11:00 PM in the night. 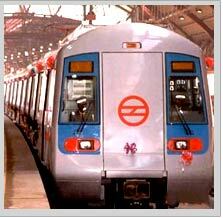 The trains on the elevated section between Shahdara and Rithala cover a distance of 22.8 Kms in about 39 minutes. The frequency of train services in the elevated section varies from 4 minutes during peak hours upto 12 minutes during non peak hours. 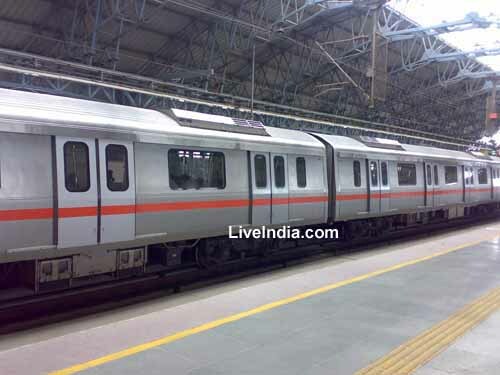 On the Underground section the train frequency varies from 8 minutes at peak time upto 12 minutes in non peak hours. The 11 Kms Underground section between Vishwavidyalaya and Central Secretariat is covered in 18 minutes 30 seconds approximately. Line III (Barakhamba - Dwarka Sector 9) cover a distance of 29.29 Kms. The frequency varies 8 minutes at peak hours and 12 minutes in non peak hours. The 29.29 Kms section between Barakhamba - Dwarka Sector 9 section is covered in 55 minutes 30 seconds approximately.